I love these cookies. Whether they're called snowballs, Mexican Wedding Cakes, Armenian sugar cookies or whatever--I love them. I found this variation--the vegan Russian Teacake--at PCC. I can't be sure, but it *might* be from Flying Apron. 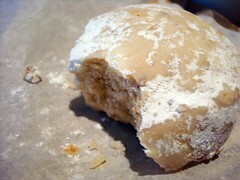 It was a crumbly and slightly messy cookie, but the sandy, sugary, nutty taste was pure deliciousness. With a touch of salt (so important to sweets!) it was nicely balanced; in fact, I liked this cookie so much I went back for a second one. As for the vegan aspect, to be honest, if it hadn't been labeled as such, I probably would not have known that it lacked dairy; certainly there was nothing lost flavorwise. Vegan Russian Teacake from PCC in Fremont.